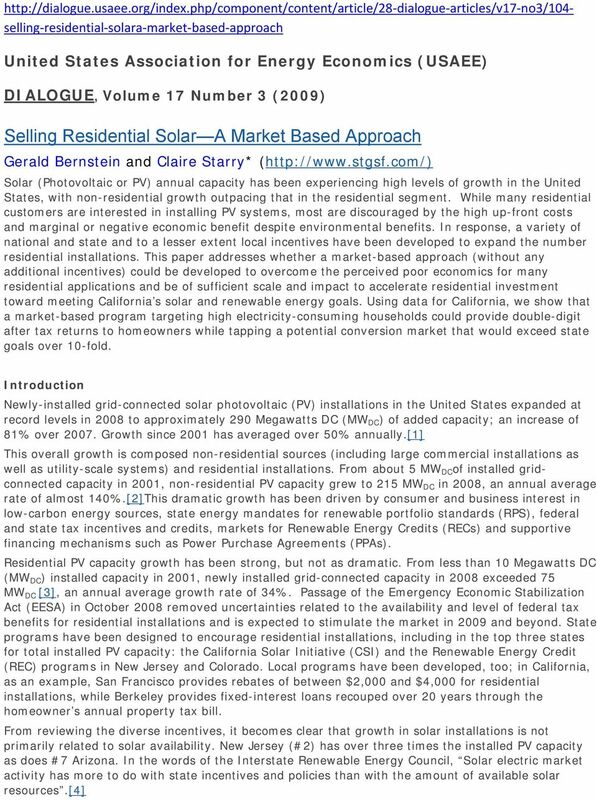 Download "Selling Residential Solar A Market Based Approach"
1 dialogue articles/v17 no3/104 selling residential solara market based approach United States Association for Energy Economics (USAEE) DIALOGUE, Volume 17 Number 3 (2009) Selling Residential Solar A Market Based Approach Gerald Bernstein and Claire Starry* ( Solar (Photovoltaic or PV) annual capacity has been experiencing high levels of growth in the United States, with non-residential growth outpacing that in the residential segment. While many residential customers are interested in installing PV systems, most are discouraged by the high up-front costs and marginal or negative economic benefit despite environmental benefits. In response, a variety of national and state and to a lesser extent local incentives have been developed to expand the number residential installations. This paper addresses whether a market-based approach (without any additional incentives) could be developed to overcome the perceived poor economics for many residential applications and be of sufficient scale and impact to accelerate residential investment toward meeting California s solar and renewable energy goals. Using data for California, we show that a market-based program targeting high electricity-consuming households could provide double-digit after tax returns to homeowners while tapping a potential conversion market that would exceed state goals over 10-fold. Introduction Newly-installed grid-connected solar photovoltaic (PV) installations in the United States expanded at record levels in 2008 to approximately 290 Megawatts DC (MW DC ) of added capacity; an increase of 81% over Growth since 2001 has averaged over 50% annually. This overall growth is composed non-residential sources (including large commercial installations as well as utility-scale systems) and residential installations. From about 5 MW DC of installed gridconnected capacity in 2001, non-residential PV capacity grew to 215 MW DC in 2008, an annual average rate of almost 140%.This dramatic growth has been driven by consumer and business interest in low-carbon energy sources, state energy mandates for renewable portfolio standards (RPS), federal and state tax incentives and credits, markets for Renewable Energy Credits (RECs) and supportive financing mechanisms such as Power Purchase Agreements (PPAs). Residential PV capacity growth has been strong, but not as dramatic. From less than 10 Megawatts DC (MW DC ) installed capacity in 2001, newly installed grid-connected capacity in 2008 exceeded 75 MW DC , an annual average growth rate of 34%. Passage of the Emergency Economic Stabilization Act (EESA) in October 2008 removed uncertainties related to the availability and level of federal tax benefits for residential installations and is expected to stimulate the market in 2009 and beyond. State programs have been designed to encourage residential installations, including in the top three states for total installed PV capacity: the California Solar Initiative (CSI) and the Renewable Energy Credit (REC) programs in New Jersey and Colorado. Local programs have been developed, too; in California, as an example, San Francisco provides rebates of between $2,000 and $4,000 for residential installations, while Berkeley provides fixed-interest loans recouped over 20 years through the homeowner s annual property tax bill. From reviewing the diverse incentives, it becomes clear that growth in solar installations is not primarily related to solar availability. New Jersey (#2) has over three times the installed PV capacity as does #7 Arizona. In the words of the Interstate Renewable Energy Council, Solar electric market activity has more to do with state incentives and policies than with the amount of available solar resources. 2 The question we address is whether market-based mechanisms with clear economic benefits to homeowners can be relied upon to support residential PV system developments. And, if a market focus could be identified and achieve results, would the incentives be of sufficient magnitude to meet state environmental goals. In other words, could a market-based program be designed that would have more than a niche impact? To answer this question, we conduct two assessments. In the first we determine under what conditions a residential system could be economically attractive for the homeowner. In the second, we estimate the number of residences to which these conditions apply. Due to data availability (described below) we have focused on conditions in California; with 67% of all US grid-connected solar capacity in this state, it provides a highly indicative basis for analysis. Estimating Financial Returns for Residential Solar Installation From a purely financial standpoint, solar panel installation makes sense only if, for a reasonable lifetime, the cost of solar-supplied electricity is less than the cost of utility-supplied electricity (that is, there is a positive return on investing in solar systems). Estimates for return on investment for solar installation recently have been reported by several authors, including Allen, et. al. and Andy Black. Both articles conclude that given rising rates for electric power and falling costs of solar power, especially with recent tax and other incentives, the internal rate of return on solar investment is competitive, in the range of a 5% to 11% return on investment (ROI). Our analysis, based on the current cost of electricity from a solar system and the cost of utilityobtained electricity, identifies under what conditions the former is competitive with the latter. Our calculations indicate that, despite federal and state incentives, for the majority of California households, solar energy costs more than purchased electricity. But for a small but important share of households, there are strong financial incentives for installing PV systems to provide at least some of their electricity demand. 4 PV Supplied Electricity Costs Table 1 provides estimated costs of installing solar panels. The California Public Utilities Commission estimates $9.44 per watt for small commercial and residential systems.assuming a 20 year life, even with a federal tax credit and the CSI rebate, residential solar systems provide electricity in the range of 20 to 25 cents per kwh. Utility-Supplied Electricity Costs Within California, as in many states, the rates charged for residential service vary significantly not only by utility but also by allowable baseline consumption, consumption at steps (tiers) above baseline, and the rates at each tier. Baseline consumption varies by location for most utilities, with households located in hot, inland areas given a higher baseline than households living in the temperate costal regions. 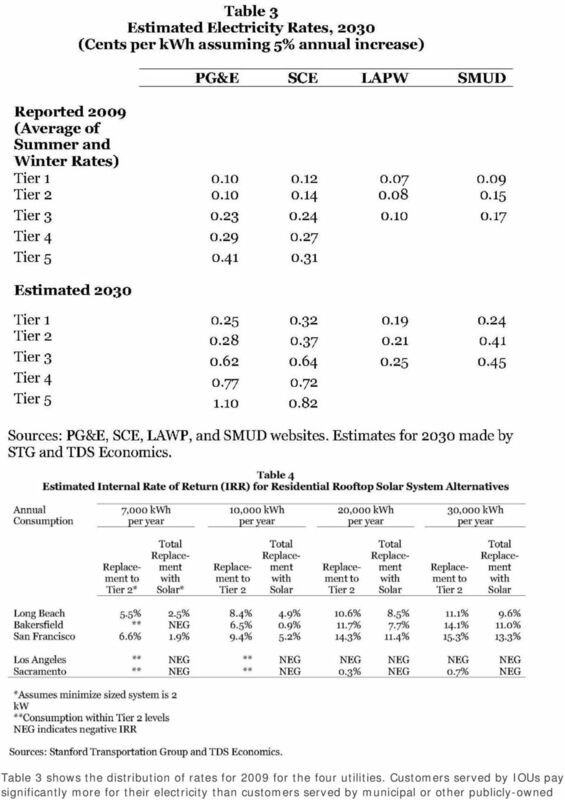 Table 2 shows representative ranges of baseline amounts for the two largest investor owned utilities or IOUs (Pacific Gas and Electricity (PG&E) and Southern California Edison (SCE)) and for the two largest publicly owned utilities (Los Angeles Water and Power (LAWP) and Sacramento Municipal Utility District (SMUD)). 6 utilities. Baseline rates for IOUs are about 33% higher, and the difference increases with amount of energy used. For example, baseline rates for PG&E average about 10 cents per kwh but rise to over 41 cents per kwh at higher tiers. Rates for municipal utilities are under 18 cents per kwh. When comparing current electric utility rates with solar costs, it is clear that only selected customers can financially benefit from installing a residential PV system. Current electricity rates for municipal owned utilities, especially the largest, LAWP, are almost entirely below the costs of solar-generated electricity (Table 1). However, for households served by IOUs, with electricity consumption pushing them into Tiers 3, 4, and 5, and paying 24 to over 40 cents per kwh to buy from the IOU, the price they are paying for at least some of their purchased electricity exceeds the estimated cost of electricity from residential solar systems. To move into Tier 3 or higher, IOU-served households with both gas and electric appliances must purchase from 6,500 to 20,000 kwh annually, depending on location; all-electric households must purchase about 10,000 to 25,000 kwh to move into Tier 3. Over time, as electricity prices increase, more households will find solar cost-competitive. The speed at which this happens depends on future installed solar panel costs (which have been falling) and future costs of purchasing electricity from utilities. Residential electricity prices in California rose 6.7% annually for the two major investorowned utilities from 1970 to 2001 (). This rate of escalation appears to be continuing; average residential electricity prices in California rose from cents to cents per kwh between May 2008 and May 2009, or by 7.7%. Table 3 also gives estimated electricity rates by utility in 20 years assuming 5% per year escalation. Household That Would Benefit from PV-Generated Electricity To further our conclusion that households served by IOUs and consuming sufficient electricity to move them into Tier 3 or higher can financially benefit from solar systems, we conducted a financial analysis to compute the internal rate of return for solar installation. Alternative scenarios using various rates of consumption in several different cities throughout California were analyzed, covering households served by investor-owned utilities and by municipal utilities. We assumed that the solar systems would have a 20 year life, a new inverter would be required after 10 years, and the cost of disposal at the end of the 20 years would be $3000. Annual AC output from a 4 kw DC array was obtained for each city using the National Renewable Energy Laboratory PV Watts Calculator assuming fixed tilt at latitude and southerly orientation. Representative results of our analysis are shown in Table 4. We selected four alternative annual rates of electricity consumption 7,000 kwh, or approximately the average per household consumption in California, and higher rates of 10,000, 20,000, and 30,000 kwh per year. The table shows the estimated internal rate of return (IRR) assuming a household installs solar capacity to reduce purchases from utilities to eliminate any Tier 3 and higher consumption, utility-supplied electricity prices rise at a 5% average annual rate, and also assuming that the system installed is sufficiently large to offset all electricity consumption (zero net purchases from a utility). 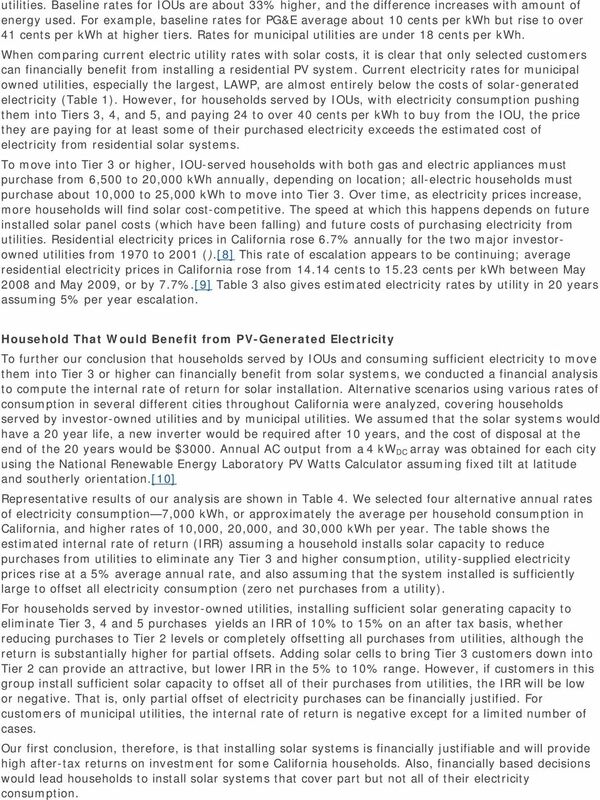 For households served by investor-owned utilities, installing sufficient solar generating capacity to eliminate Tier 3, 4 and 5 purchases yields an IRR of 10% to 15% on an after tax basis, whether reducing purchases to Tier 2 levels or completely offsetting all purchases from utilities, although the return is substantially higher for partial offsets. Adding solar cells to bring Tier 3 customers down into Tier 2 can provide an attractive, but lower IRR in the 5% to 10% range. However, if customers in this group install sufficient solar capacity to offset all of their purchases from utilities, the IRR will be low or negative. That is, only partial offset of electricity purchases can be financially justified. For customers of municipal utilities, the internal rate of return is negative except for a limited number of cases. 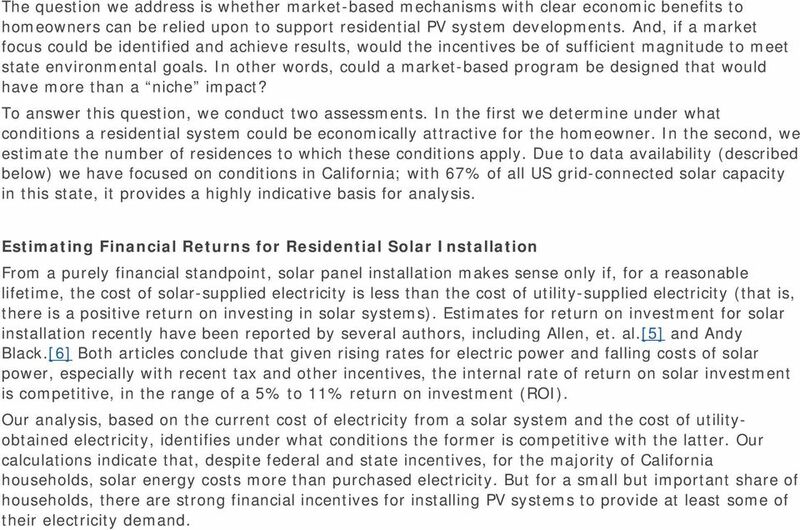 Our first conclusion, therefore, is that installing solar systems is financially justifiable and will provide high after-tax returns on investment for some California households. Also, financially based decisions would lead households to install solar systems that cover part but not all of their electricity consumption. 7 Finding a Million Households The second objective of our analysis is to determine the number of households in this target group households with electricity consumption over 10,000 kwh per year and served by IOUs. Are there enough to achieve a noticeable impact? According to the California Energy Commission, in % of California s households were served by IOUs and the remaining 21% by publicly-owned utilities. About 78% of retail residential deliveries were through IOUs. Pacific Gas and Electricity (PG&E) serves the most households of any utility and provides 35% of retail residential deliveries, closely followed by Southern California Edison (SCE), which provides 33% of the deliveries. San Diego Gas and Electric (SDGE) serves 9% of California s households. Los Angeles Water and Power (LAWP) is the largest municipal utility, and Sacramento Municipal Utility District (SMUD) is the second largest. Together, these two utilities account for about two-thirds of the households served by publicly owned utilities. 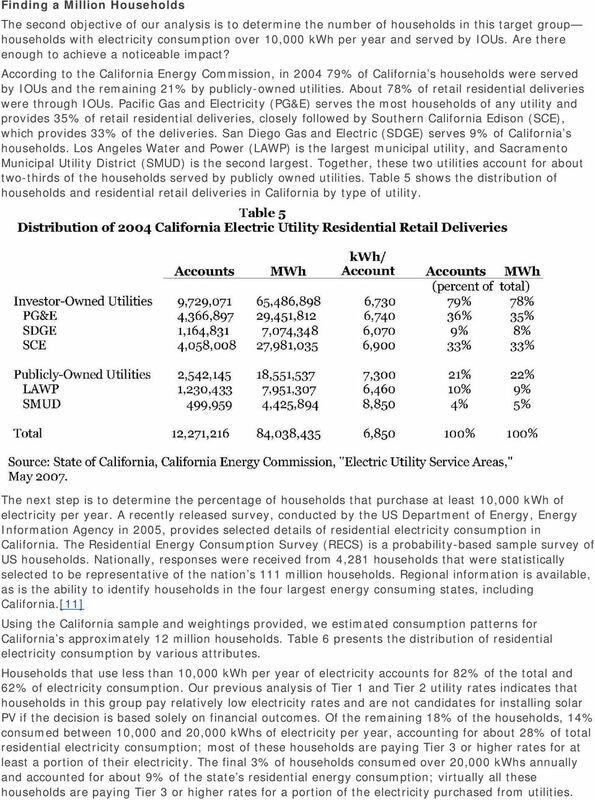 Table 5 shows the distribution of households and residential retail deliveries in California by type of utility. The next step is to determine the percentage of households that purchase at least 10,000 kwh of electricity per year. A recently released survey, conducted by the US Department of Energy, Energy Information Agency in 2005, provides selected details of residential electricity consumption in California. The Residential Energy Consumption Survey (RECS) is a probability-based sample survey of US households. Nationally, responses were received from 4,281 households that were statistically selected to be representative of the nation s 111 million households. Regional information is available, as is the ability to identify households in the four largest energy consuming states, including California. Using the California sample and weightings provided, we estimated consumption patterns for California s approximately 12 million households. Table 6 presents the distribution of residential electricity consumption by various attributes. Households that use less than 10,000 kwh per year of electricity accounts for 82% of the total and 62% of electricity consumption. Our previous analysis of Tier 1 and Tier 2 utility rates indicates that households in this group pay relatively low electricity rates and are not candidates for installing solar PV if the decision is based solely on financial outcomes. Of the remaining 18% of the households, 14% consumed between 10,000 and 20,000 kwhs of electricity per year, accounting for about 28% of total residential electricity consumption; most of these households are paying Tier 3 or higher rates for at least a portion of their electricity. The final 3% of households consumed over 20,000 kwhs annually and accounted for about 9% of the state s residential energy consumption; virtually all these households are paying Tier 3 or higher rates for a portion of the electricity purchased from utilities. 8 While the RECS data provides insight into the distribution of households by electricity consumption and type of housing, it does not provide information on their location or whether they purchase electricity from an IOU or municipal utility. To estimate the number of households that are possible candidates for solar installations, we used the following assumptions: Only households living in single family units are counted. 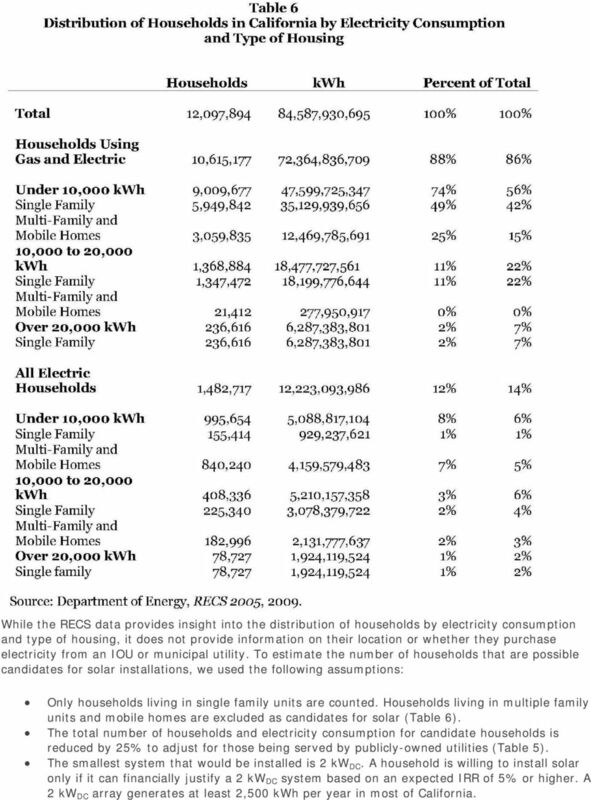 Households living in multiple family units and mobile homes are excluded as candidates for solar (Table 6). The total number of households and electricity consumption for candidate households is reduced by 25% to adjust for those being served by publicly-owned utilities (Table 5). The smallest system that would be installed is 2 kw DC. A household is willing to install solar only if it can financially justify a 2 kw DC system based on an expected IRR of 5% or higher. A 2 kw DC array generates at least 2,500 kwh per year in most of California. 9 For gas and electric households, Tier 3 rates are assumed to apply when the consumption exceeds 8,000 kwh per year. For all electric households, Tier 3 rates apply when consumption exceeds 12,000 kwh per year. These estimates are based on averages shown in Table 2. Households with all-electric utilities and heating consuming more than 14,500 kwh per year are assumed to be candidates for installing PV systems to bring their purchased deliveries to 12,000 kwh per year and gas and electric households consuming more than 10,500 kwh per year are assumed to be candidates for installing PV systems to bring their purchased deliveries to 8,000 kwh per year. The results of our analysis are presented in Table 7 and Figure 1. 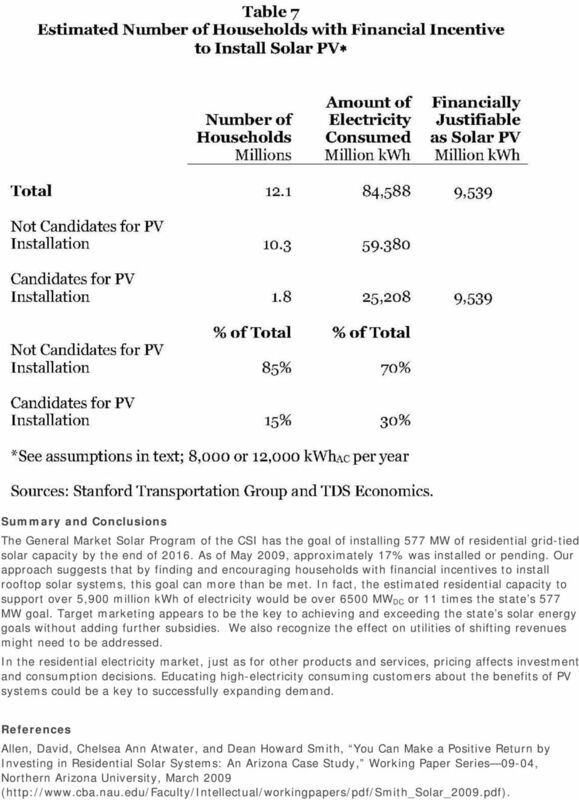 Using the above assumptions, of the approximate 12.1 million households in California, about 15% are candidates for installing solar panels for at least part of their electric consumption based solely on financial justifications. 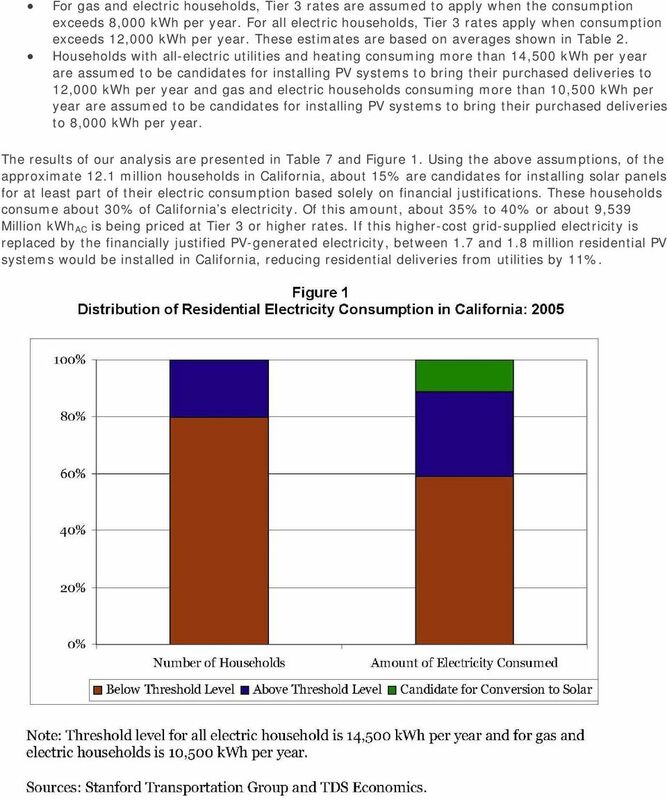 These households consume about 30% of California s electricity. Of this amount, about 35% to 40% or about 9,539 Million kwh AC is being priced at Tier 3 or higher rates. If this higher-cost grid-supplied electricity is replaced by the financially justified PV-generated electricity, between 1.7 and 1.8 million residential PV systems would be installed in California, reducing residential deliveries from utilities by 11%. 11 Black, Andy, Payback on Residential PV Systems with Uncapped 30% Federal Investment Tax Credit. American Solar Energy Society, Solar 2009, May 2009 ( Black, Andrew J. 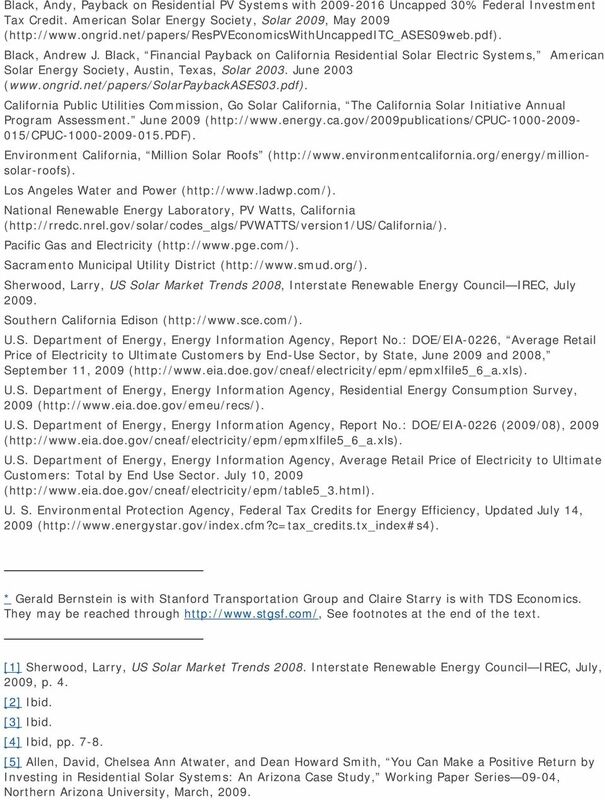 Black, Financial Payback on California Residential Solar Electric Systems, American Solar Energy Society, Austin, Texas, Solar June 2003 ( California Public Utilities Commission, Go Solar California, The California Solar Initiative Annual Program Assessment. 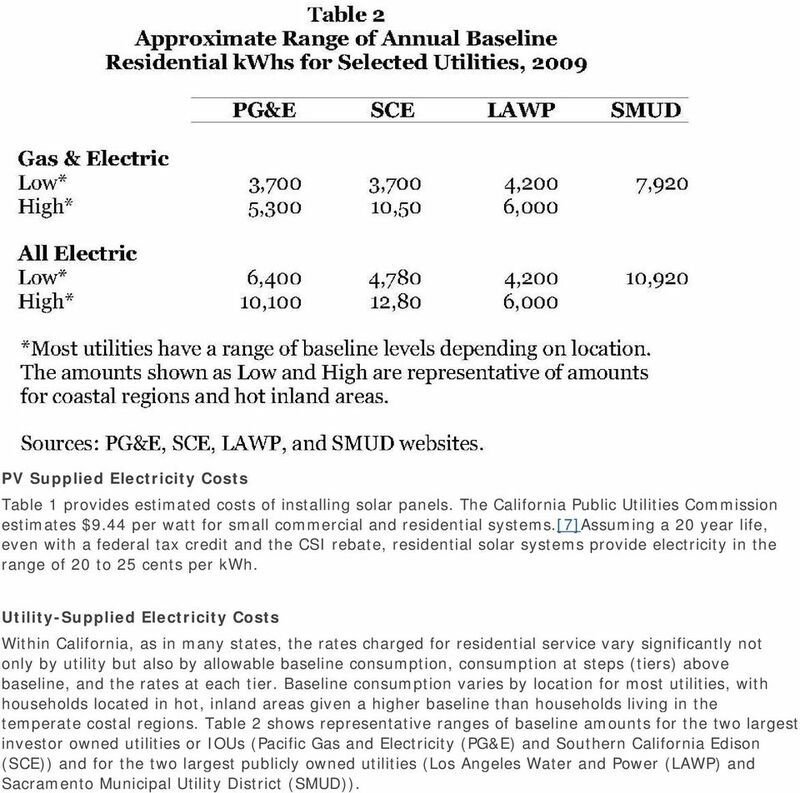 June 2009 ( 015/CPUC PDF). Environment California, Million Solar Roofs ( Los Angeles Water and Power ( National Renewable Energy Laboratory, PV Watts, California ( Pacific Gas and Electricity ( Sacramento Municipal Utility District ( Sherwood, Larry, US Solar Market Trends 2008, Interstate Renewable Energy Council IREC, July Southern California Edison ( U.S. Department of Energy, Energy Information Agency, Report No. : DOE/EIA-0226, Average Retail Price of Electricity to Ultimate Customers by End-Use Sector, by State, June 2009 and 2008, September 11, 2009 ( U.S. Department of Energy, Energy Information Agency, Residential Energy Consumption Survey, 2009 ( U.S. Department of Energy, Energy Information Agency, Report No. : DOE/EIA-0226 (2009/08), 2009 ( U.S. Department of Energy, Energy Information Agency, Average Retail Price of Electricity to Ultimate Customers: Total by End Use Sector. July 10, 2009 ( U. S. Environmental Protection Agency, Federal Tax Credits for Energy Efficiency, Updated July 14, 2009 ( * Gerald Bernstein is with Stanford Transportation Group and Claire Starry is with TDS Economics. They may be reached through See footnotes at the end of the text. Sherwood, Larry, US Solar Market Trends Interstate Renewable Energy Council IREC, July, 2009, p. 4. Ibid. Ibid. Ibid, pp  Allen, David, Chelsea Ann Atwater, and Dean Howard Smith, You Can Make a Positive Return by Investing in Residential Solar Systems: An Arizona Case Study, Working Paper Series 09-04, Northern Arizona University, March, 2009. 12  Black, Andy, Payback on Residential PV Systems with Uncapped 30% Federal Investment Tax Credit, American Solar Energy Society, Solar 2009, May,  California Public Utilities Commission, Go Solar California, The California Solar Initiative Annual Program Assessment. June, 2009, p. 24. Black, Andrew J. 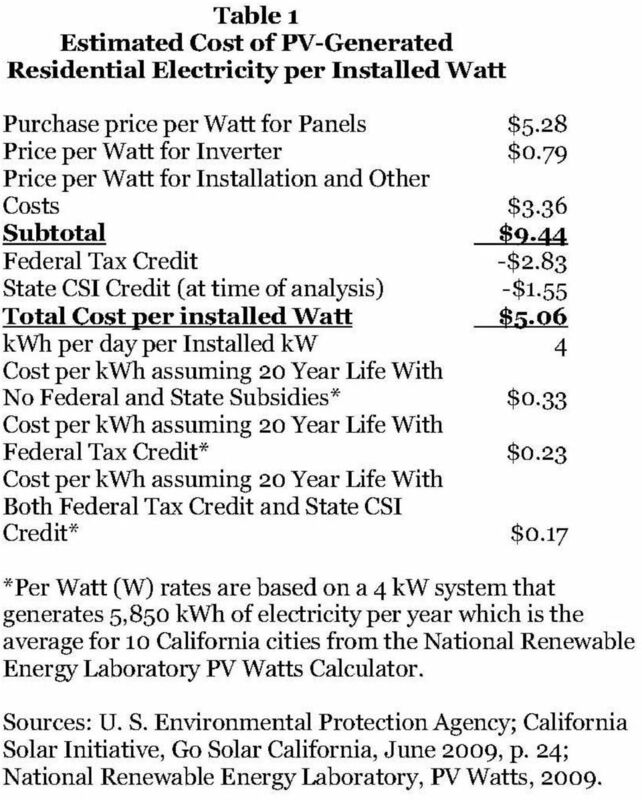 Black, Financial Payback on California Residential Solar Electric Systems, American Solar Energy Society, Austin, Texas, Solar 2003, June 26, 2003, p. 2. U.S. Department of Energy, Energy Information Agency, Report No. : DOE/EIA-0226 (2009/08). Data calculated using National Renewable Energy Laboratory. PV Watts, California, website. U.S. Department of Energy, Energy Information Agency, Residential Energy Consumption Survey, 2009.